The average lifespan of a doberman is just 10 years or 120 months or 3652 days. However you think of it, big dogs simply don’t last as long as smaller breeds. Which doesn’t make sense when you look at mammals in general. The BlueWhale lives for 80 years, yet a bat will only live for a maximum of 10 years. Yet within species, such as dogs, the larger the animal, the shorter it’s lifespan. The same happens in Horse breeds and even Mice. After a good Google, it seems it’s the accelerated growth in the first year that causes this lack of longevity. Big dogs simply die younger, because they age quicker. Far too many people purchase a doberman without sufficient appreciation either of the breed or of what the dog’s needs are. This has led to many of these dogs ending up in rescue shelters usually mislabelled as being “aggressive”. Popularity for the breed of these dogs has led to an exploitation of the breed for financial gain. Backyard breeding by people whose only interest is the money Doberman pups can bring and who have no knowledge of the breed has led to dogs with severe health problems and unstable characters. Potential Doberman owners must realise that they are entering into a nine to twelve year contract making them responsible for the dog’s health, training and well being for that entire period. It is no good to just “try” one of these dogs, comfortable in the security of the many rescue shelters to take care of the dog if you should fail in your duty to provide a suitable home later on. You must find out everything you can about them priori to getting a Doberman puppy or adult. Dobermans are loyal, graceful, athletic, intelligent, loving and protective. This dog has all the qualities of other guarding breeds but also possesses a number of unique features that sets him apart from them. One thing is for sure, this dog demands attention, kindness, precise and consistent training and masses of love. Do not enter into this partnership thinking that the dog will fit in with your life when the opposite is true. This is a dog that will demand to be at the centre of family life. They form strong bonds with their owners and cannot be shut away in a kennel or denied access to family relationships. Once this magnificent dog has bonded with you it remains glued to you for life. They are aptly nicknamed “the Velcro Dog” due to this instinctive need to be alongside their human master. How this dog responds to his owner is fuelled by what the Doberman receives back. Nothing escapes this dog’s attention. They can walk into a room and notice instantly if an object has been moved. Try hiding from the Doberman when out walking and it will be at your side before you have moved. They seem to sense what you are thinking and act accordingly. Also called “the dog with the human mind” the Dobe is sensitive to your feelings. If you dislike someone then your Dobe will too! Doberman can be very vocal dogs as anyone that has owned one will know. They make a series of sounds that alternates between a high pitched whine (usually when trying to get their own way) to deep groans of contentment. Dobermans are said to be able to hold long “conversations” with their owners. However not everyone appreciates the dog’s whining and whistling which can aggravate even the most tolerable of souls! There are not enough words to describe this dog’s appearance. According to VetStreet, doberman dogs are a combination of power, grace, elegance and intelligence. 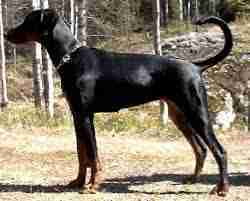 A healthy Doberman’s coat is short and shines in ripples across its muscular body. His elegant body outline and his proud and noble wedge shaped head merges into a power packed body with long athletic limbs. The Doberman has good bones, balance and structural beauty and soundness. One of the most thrilling aspects of this dog is its beauty in movement. This dog moves so effortlessly with great speed yet can change direction with ease. In some countries the Doberman’s ears are cropped and his tail docked though the UK has joined many other countries in banning this needless mutilation for cosmetic and fashion-related purposes. Left as nature intended the dog has a hound-like tail and ears that fold neatly forward, protecting the ear canal and inner ear from the damp, grime and bugs which are such a major cause of nuisance and pain to docked dogs which are not constantly being injected with ear mite drops and the like. The benefits of the tail are clearly demonstrated as its use comes to the fore when the dog is jumping or turning at speed. When the Dobe breaks into a full-flowing gallop there cannot be a more beautiful sight. Their eyes can be cold and hard if they sense danger or soft pools of moist affection as they gaze up at their master. Their eyes are forever watchful. They watch your every move and take direction from your emotions and body language. Should you tense or become startled, the eyes change from watchful to alert as the Dobe readies itself to protect its master at all costs. Despite this dog being highly trainable they do have a particular exasperating trait of suddenly deciding that today is the day that they will do their own thing! This can happen at any time or in any situation as seen in an obedience show ring. One of the top class Dobes, a male dog that held numerous titles, was being asked to retrieve a certain object. The dog calmly looked at its handler, sauntered across to the “objects”, chose one at random then raced across to drop it in a litter bin! The spectators roared with laughter which encouraged the Dobe to roll around acting the fool. For sure, a Doberman at times can be the most adorable of clowns, but this does add an extra dimension to achieving top standards of working dog obedience and general dog training with them. Advanced training is a must to achieve complete reliable obedience. 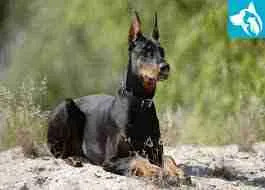 The Doberman is a working dog that has retained all its ancestors guarding and protection traits. 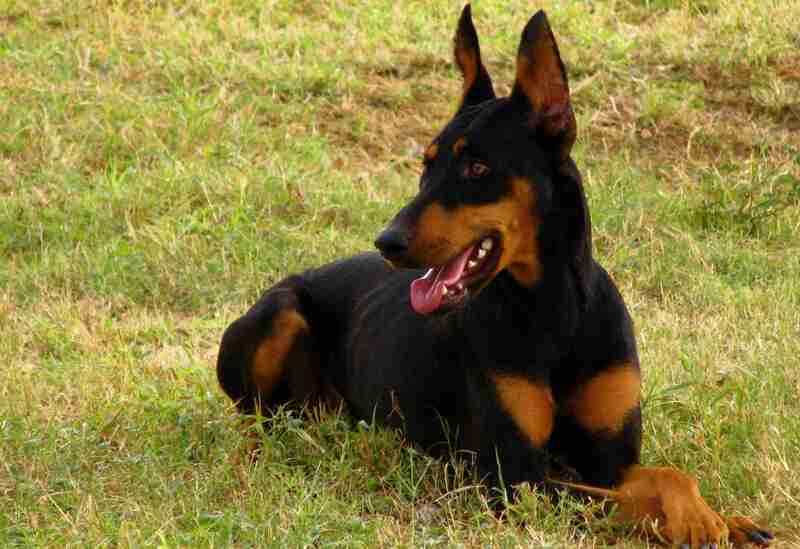 German Pinscher – alertness and quick reactions. Rottweiler – strength and stamina. Black and tan Old German Sheepdog – protective and herding instincts. The Beauceron – fighting ability. 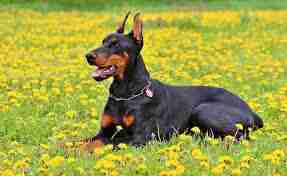 Later down the lines the Manchester Terrier was bred into the Doberman again. This eliminated the long woolly hair and replaced it with the short shiny coat of today’s dog. The head shape changed and became more elongated and the body was more compact. The feet changed to being more cat like. This all improved the appearance of the breed but some people felt that the dog lost it’s “hardness” but had gained speed, power and agility. This became a dog truly worthy of the highest regard. The Doberman is mentally superior to most breeds, with high drives, high energy and excellent working ability. The Doberman’s greatest desire is to please and work for humans. First and foremost the Doberman’s use is as a guard dog protecting the family home or workplace. No intruder will attempt to enter a Dobe’s backyard! The mere presence of the dog is warning enough. However the doberman does have a more gentle side and this has been proved on many occasions as a guide dog for the blind, therapy dog or a hearing dog. As a guide dog for the blind, the Dobe has a good record of being highly trainable, devoted and loyal. The dog senses when a human is in pain or distress and are often used as therapy dogs to comfort the sick and dying. They will remain still for hours letting their human friends stroke and fuss them and seem to bring great comfort to people in need. Often overlooked is the Doberman as a “field” dog. The Dobe can naturally “point” and can follow a scent as good as most trials dogs. They can be trained to be excellent retrievers. In some countries such as Africa they have been trained to hunt big game. Their speed and stamina enable the Dobe to hunt lion, deer, and antelope to “hold” them until the hunter arrives. The earliest use of the Doberman by the Germans then later, by other armies who referred to it as a “war dog”. The Germans had, by World War 1, enlisted the help of thousands of Doberman to act as guards, messengers, pulling carts, pulling the wounded from battlefields and in many other ways to the benefit of their troops. So successful were these dogs that a training school was set up with the sole purpose of training Doberman to be used in the armed forces and as Police dogs. Other countries realized the benefits of this awesome dog and the Doberman was being bred by the hundreds of thousands to meet demands. In later years, the dog was replaced by the more adaptable German Shepherd. The Doberman did not do well in severe weather conditions and disliked the hot and humid temperatures of the Middle East. The Doberman excels at canine sports such as Agility, Flyball, Obedience trials and Working trials. One usually associates the Border Collie as reigning supreme in Agility competitions but the Doberman is also an incredible agility athlete. The argument against tail docking is supported as the Dobe races around the agility ring. Flying over jumps one can clearly see that the tail is used to aid balance and direction. The Doberman loves to work and they are willing to try anything that is asked of them. 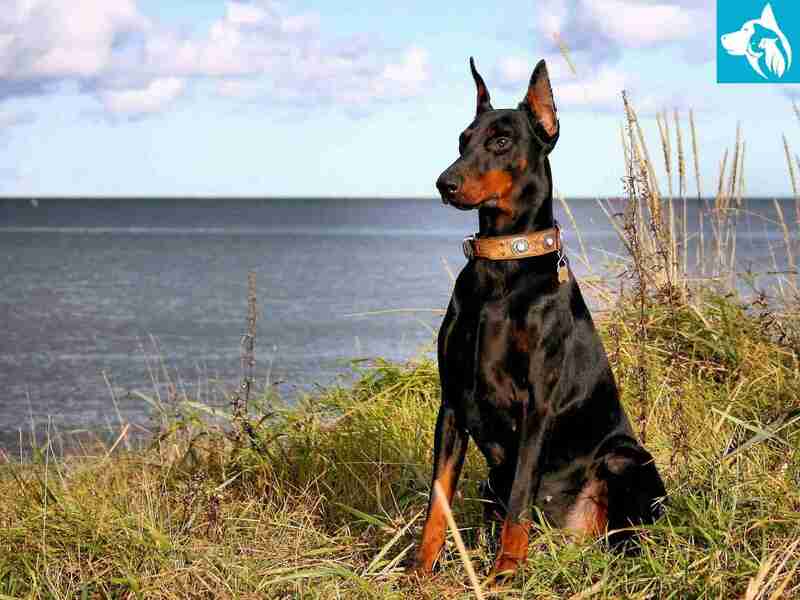 The Doberman is an excellent search and rescue or (SAR) dog. SAR dogs are trained to locate people that are lost in the wilderness, trapped under avalanches or disaster areas and many other situations. A Doberman does not have to be trained to use his nose, it only needs to be motivated into using it correctly and follow the air scent to a victim. Because the Doberman has extremely well developed drives as a puppy they are perfect candidates for SAR training. The breed is renowned for their ability to learn and retain experiences needed for handler and dog to work as a team. The Doberman covers ground quickly and effectively. They have a short coat which can be a benefit when searching disaster sites. Dogs that are required to work with the police, SAR, and other services are tested for their desire to work, courage, intelligence, perseverance and protective instincts. People often misinterpret this sport as being one that trains a dog to be aggressive and attack people. This could not be further from the truth as a dog, it is at all times 100% under the control of its handler and seen through the dog’s eyes this is just another form of “working”. 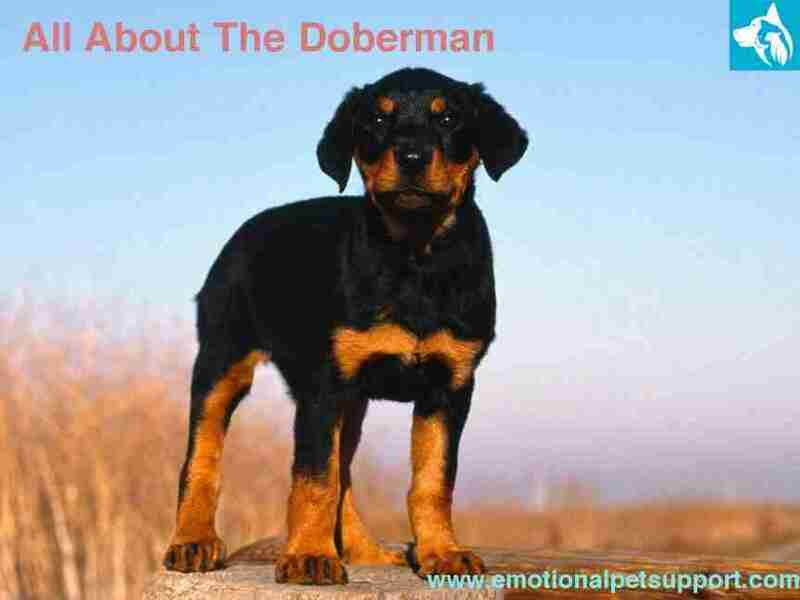 The Doberman has all the criteria needed to master the challenges that test the dog’s character and physical abilities. At the end of the day, this elegant, muscular, powerful, lively dog has an extremely complex character. The Doberman is a body guard capable of handling any situation and works instinctively and independently. For a well adjusted and confident dog, mental stimulation is important. These dogs have been bred to work for man and although the Doberman of today is far less aggressive than their ancestors they have retained strong working instincts. Their intense character often borders on stubbornness. They have a very strong will which is why they need an owner whose character matches that of their own. If you have a doberman or a dog and you’re trying to get an emotional support animal letter for it, please visit our homepage and get started by taking our exam today!